I find it difficult to get my head around Women’s Day or Women’s Month…you see, I do believe that women are just phenomenal all year round! My Women’s Month kickstarted when my friend and colleague, Yogas Nair, was appointed as editor of the ‘Post Newspaper’. She is one of the real go getters I know that has kept climbing life’s mountains. Yogas and I go way back and she gave me my first ‘newspaper break’ by featuring my recipes in the Post many years ago. Looking back, it was one of those big career moments in my career and it gave me the platform to learn so much more. I went on to write for ‘The Star’, ‘Daily News’ and the ‘Sunday Times Extra’. However, all roads do seem to lead back to the Post and I am pleased that my recipes will be featured once again! Cooking Class Update: The Curry Trail – learn how to use your spices to make curries from around Asia….Lamb Vindaloo, Sri Lankan Chicken Curry, Thai Green Prawn, Paneer in Almond Sauce, Rotis and Coconut Creme Brulees. The duration of the class is two hours and is followed by a sit down lunch. Bookings essential. Cooking Class Update: Spice Spice Baby…learn how to add spices to your everyday meals to cook up quick and easy fuss free meals. Traditional Lamb Jalfrezie, Creamy Chicken Curry, Mushroom Mattar, Balti Prawn Curry, Samosas and Boozy Cream Cake. The duration of the class is two hours long and is followed by a sit down dinner. Bookings essential. Cooking Class Update: Curry 101 Hands on Class – learn how to use spices to make delicious spicy meals in a flash….Lamb Rogan Josh, Chicken Korma, Coconut Prawn, Mushroom and Chickpea Curry, Rotis and Chocolate Ganache Cake. The duration of the class is two hours and is followed by a delicious lunch. Bookings essential. Please email us at hetals@iafrica.com to book or call 011 – 4672661 to book your spot. All ingredients are provided. The Post Women’s Day edition was a special one with a real cause for celebration as Yogas not only took on the role as editor but it marked the first female editor in 60 years! AMC cookware also joined in our celebration by sponsoring a R5000 prize for Women’s month! 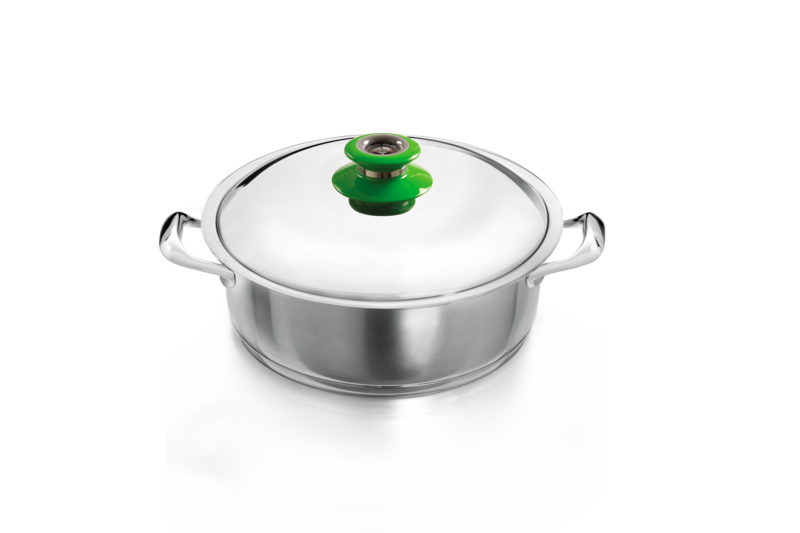 Women’s Month Prize….30cm Gourmet Roaster from AMC cookware! For more details on the competition, don’t forget to get your copy of the Post Newspaper on Wednesdays! What better way to celebrate Women’s Month than a feature on cakes in the Post Newspaper? Here is one of the recipes featured in the Women’s Day edition…. This is a delicious buttery cake with a delicate crumb. It can be frosted but I chose to drizzle milk chocolate over instead for a lighter version. Grease a 22 – 25cm bundt tin with butter and then dust the tin with flour. Shake off the excess flour. Cream the butter and sugar with an electric beater until very light in colour. Add the salt and add the eggs one at a time, beat well after each addition. Pour the milk into the creamed mixture – the mixture may look curdled but will come together at the next stage. Divide the flour into two bowls. Add the chocolate chips to one bowl and the cocoa powder to the other. Divide the baking powder between the two bowls. Divide the creamed mixture into the two bowls with flour and mix well to ensure the ingredients are well combined and form a soft thick batter. 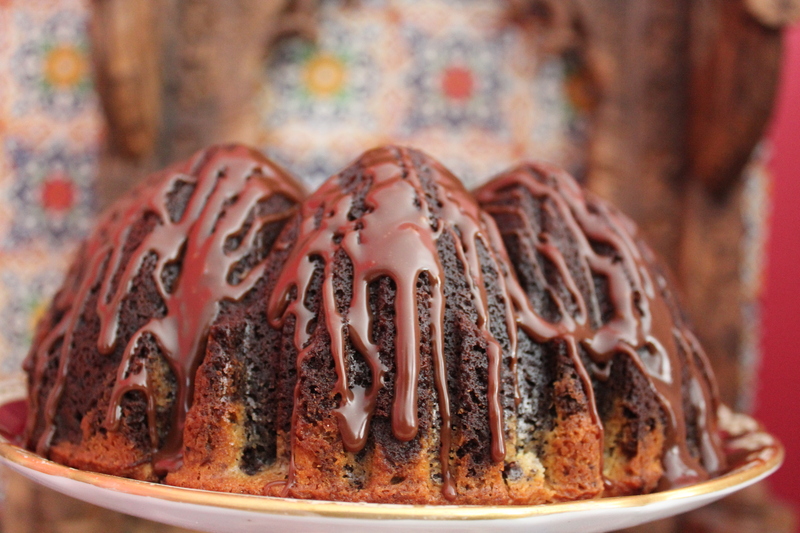 Spoon the chocolate mixture into the bundt tin and use a spoon to creating a trough for the chocolate chip mixture. Scoop the second batch of batter into the tin. Use the back of the spoon to smooth the top. Bake the cake for 45 – 50 minutes depending on the size of the tin. A skewer should come out clean when the cake is tested. Leave to cool in the tin for 15 – 20 minutes and then turn out onto cake platter. Heat the milk and butter. Add the chopped milk chocolate and then stir until smooth. If the mixture appears lumpy, heat the chocolate for 10 second intervals in the microwave, stirring well after each time. Spoon the melted chocolate over the cake, letting some of the drizzle run down the sides of the cake.